Conduct a flight from San Luis County Regional Airport (KSBP) to Santa Maria Airport (KSMX) without any en-route air traffic control services. Become familiar with radio communications when departing a Class D airport. Review radio communications when arriving at a Class D airport. Fly from KSBP to KSMX without any en-route ATC services. Inform ATC on initial contact at KSBP that you are performing the CAT-4 Rating. Both KSBP and KSMX are located in Class D airspace. Prior to operating in Class D airspace you must have two way radio communications with ATC. This consists of calling ATC and having them reply with your callsign. En-route you will generally be operating in Class E airspace. 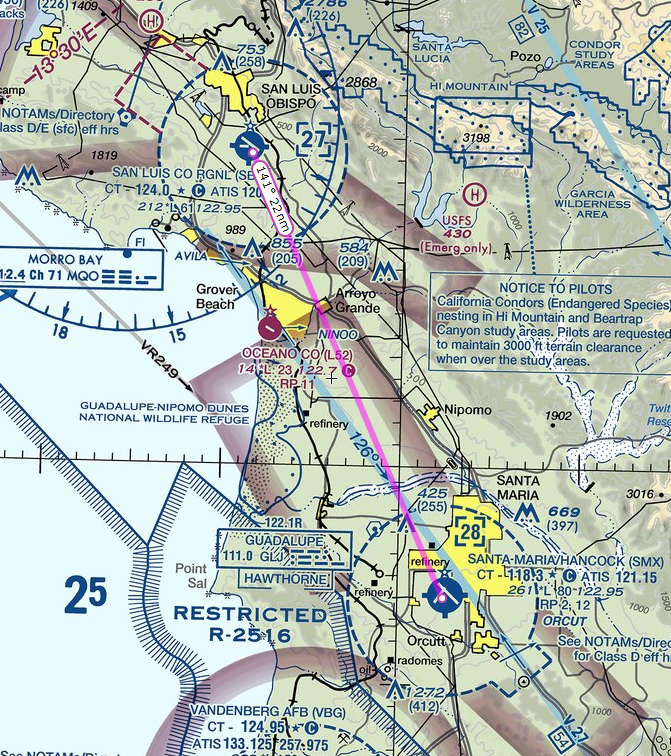 There are generally no requirements to operate in Class E airspace. When departing a Class D airport you will start by contacting ground with your location, direction of departure (South), and the ATIS code. Ground will issue taxi instructions and you’ll taxi to the runway in use. If the tower specifies a specific pattern leg to depart on simply fly the pattern as normal to that point and then fly away from the airport on that leg. If the tower did not specify a pattern leg to depart on you may depart however you like. Once clear of the Class D airspace it is NOT necessary to ask the tower for a frequency change. You may simply tune to another frequency as soon as you clear the airspace. When clear of the KSBP Class D airspace you can switch off of tower frequency. En-Route Monitor 121.5. When 10NM from KSMX and after getting the ATIS.